Bayesian analysis of complex models based on stochastic processes has in recent years become a growing area. 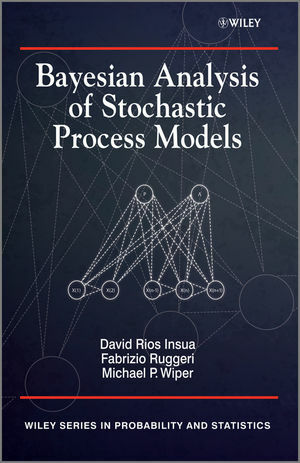 This book provides a unified treatment of Bayesian analysis of models based on stochastic processes, covering the main classes of stochastic processing including modeling, computational, inference, forecasting, decision making and important applied models. Looks at inference, prediction and decision making. Fabrizio Ruggeri, Research Director, CNR IMATI, Milano, Italy. Michael P. Wiper, Associate Professor in Statistics, Department of Statistics, Universidad Carlos III de Madrid, Spain. David Rios Insua, Professor of Statistics and Operations Research, Department of Statistics and Operations Research, Universidad Rey Juan Carlos, Spain.